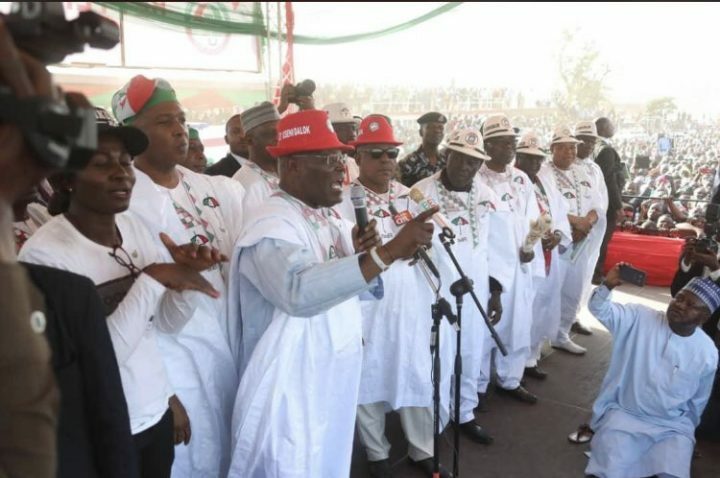 Ambassador Yahaya Kwande, elder statesman and member of the APC Board of Trustees (BOT), was among dignitaries that attended the PDP presidential campaign rally in Jos on Saturday, the News Agency of Nigeria (NAN), reports. PDP Presidential Candidate, Alhaji Atiku Abubakar, PDP National Chairman, Uche Secondus and Senate President Bukola Saraki at the Party’s Presidential campaig Rally in Jos, Plateau state. A News Agency of Nigeria (NAN), correspondent covering the event reports that the party big wigs were joined by Sen. Jeremiah Useni, the governorship candidate of the party in the state, and his running mate, Dr. James Dalok.